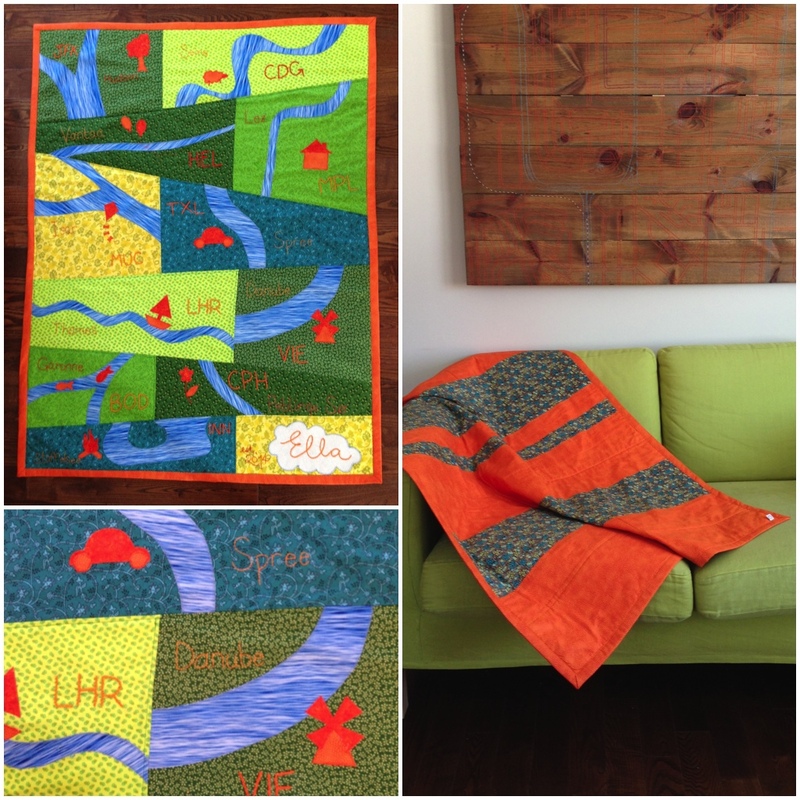 This spring I accepted one of the most heartfelt quilt commissions I’ve ever had the pleasure to receive. In my head I call it the Berlin Baby Quilt — but really, it should probably be called the Euro-America Quilt since it represents 11 friends in 11 cities: Helsinki (Finland); New York (United States); Paris (France); Murnau (Germany); London (England); Montpellier (France); Vienna (Austria); Copenhagen (Denmark); Munich (Germany); Bordeaux (France); and Berlin (Germany). I received the commission from my dear friend Lisa from dance school days –she was the one who tucked my unsure-and-2000-miles-from-home-in-a-big-city-self under her wing on the first day of classes, offered me her unconditional friendship, shared a locker with me (which we wallpapered in floral drawer liners, obviously! ), filled me in on years of complex history and dance politics for that community, got me my first independent costume commission, and danced in my first piece of Toronto-student choreography — that kind of friend. Solid. The kind you never forget however brief your time was together and always feel warm and grateful towards. Lovely Lisa circa. 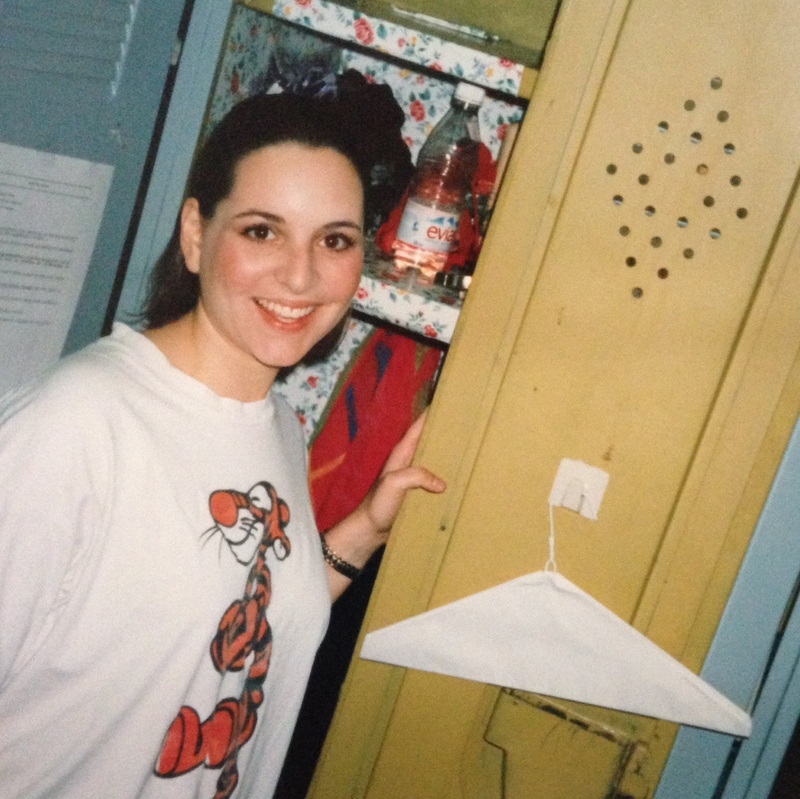 1998 in front of our floral locker and sporting performance make up. She may kick me for including this, but she’s so sweet, non?! I couldn’t resist! She’s one-of-a-kind and is now a rock-star level arts educator and administrator in New York City (lucky city to have her, they have no idea!). But I digress. So Lisa called me with this commission idea from her and a tight group of European friends … these friends of hers are part of a circle of 11 who all met during their studies and travels. Each lives in a different city scattered across Europe and America. And they have the most beautiful tradition: whenever one of them has a baby, the rest commission a quilt for the baby that represents each of them, geographically scattered though they may be, and thus the new family has a charming and practical daily reminder of their dear, faraway friends. The problem was that the couple from Berlin were the ones who always arranged the quilt, but this time they were the pregnant ones, and none of the others had that quilter’s contact info. But Lisa remembered that I sew and so I “won” the contract — and I’m so glad! 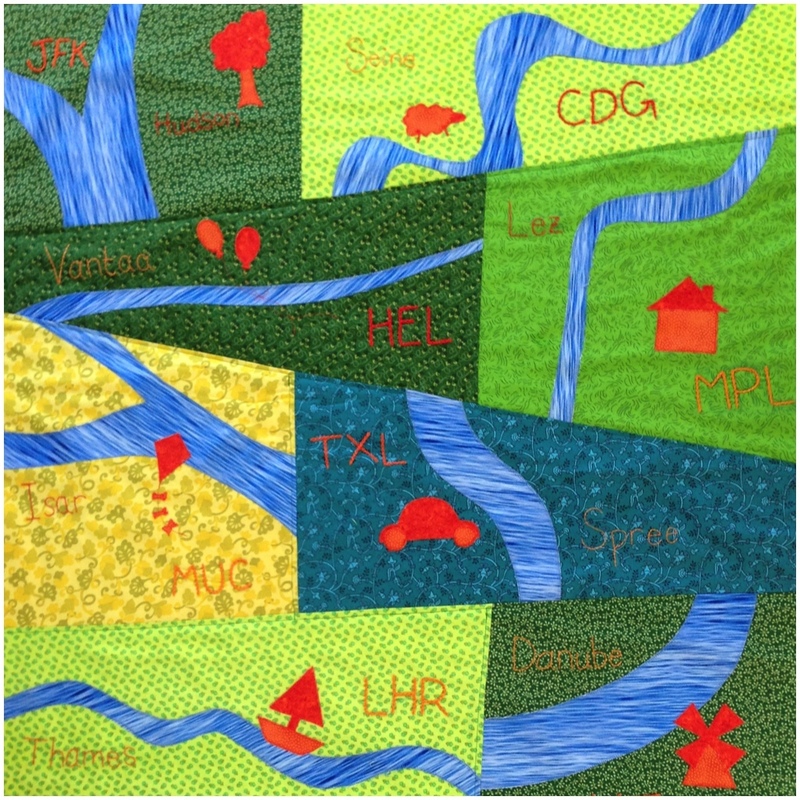 We decided on a quilt that represented each friend via the main river or water body of the cities they lived in, along with the 3-letter IATA code for the airport of that city. And lastly, I added little pieces of transportation, nature, animal, whimsey and shelter for contrast and interest. I finally got to use the applique stitching functions on my new sewing machine and also got acquainted with double sided, peel and stick interfacing for the detailed appliques. All together it was a learning experience and the most charming process. 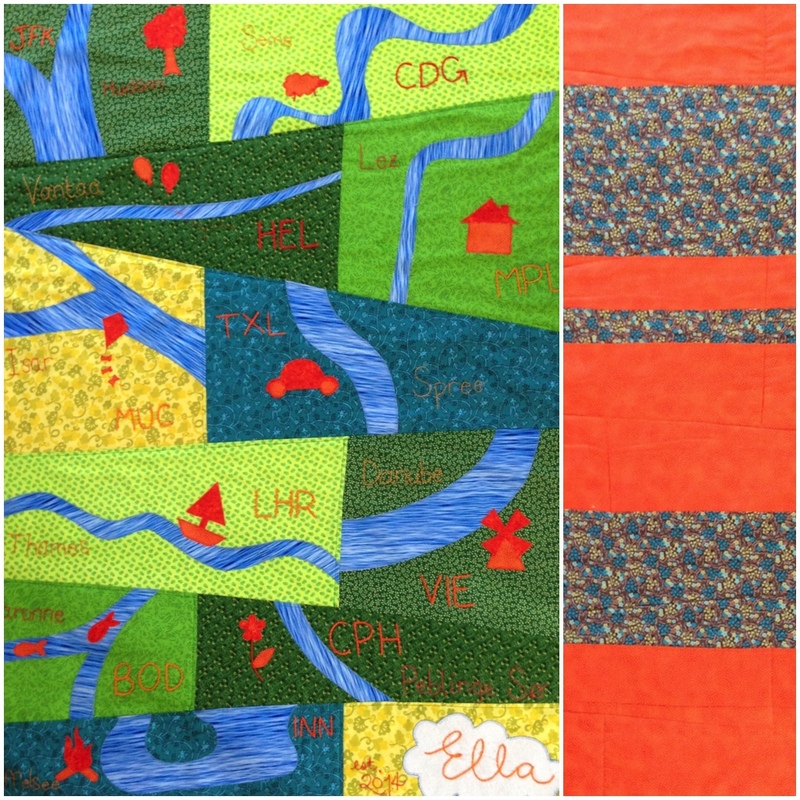 I loved researching the cities for their rivers and choosing an archetypal bit of the river for each quilt section. Embroidering the IATA’s and river names made me feel like the secret 12th member of their lovely friend circle. I kind of didn’t want to finish I enjoyed the making so much. And once baby Ella was born in Berlin, I added her name and birthdate in the 12th piece (I love that they wanted to wait til she was born for the quilt to be finished, no chickens counted before hatching), and off went the quilt. Canada Post and Deutsche Post, bless/curse them, had some communication issues and I tracked the package helplessly online as it bounced around German cities for no apparent reason for about 6 weeks, but eventually the slightly more mature Ella received her international quilt. She’s snuggled in the arms of her parents’ friendship circle every day no matter how far away their actual arms are. What a beautiful quilt! Such a wonderful story for Ella to now be a part of. Thanks Shawn! I heartily agree!